Serologic testing allows for rapid detection of candidemia. More data are needed for the Virion\Serion ELISA antigen test (Ag), Hemkit Candida IHA antibody test (Ab), and Wako β-1,3-d-glucan assay (BDG). Tests were performed on serum samples from 120 cases of culture-confirmed candidemia and 44 Candida-negative controls. Sensitivities and specificities of individual tests as well as combinations were assessed. The overall sensitivity of Ag, Ab, and Ag/Ab testing was 30, 40, and 54%, respectively, while in transplant patients it significantly dropped to 16, 26, and 40% (p = 0.02). For BDG testing it was 67%, both overall and in transplant patients. Especially Ag testing performed poorly among women ≤ 65 years with a significantly reduced sensitivity of 9% (p < 0.002). While the sensitivity of Ag/Ab testing was somewhat higher at 67% for C. albicans, it was significantly lower for non-albicans species at 42% (p = 0.006). 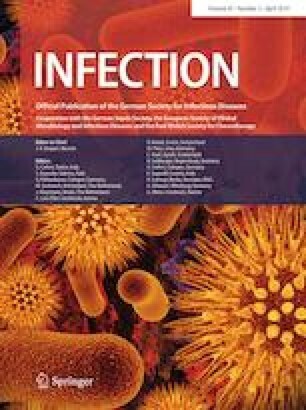 The sensitivity of BDG testing for C. albicans and non-albicans species was not significantly different at 64 and 69%, respectively. Both Ag/Ab and BDG testing had a high specificity of 93%, for Ag testing it was 100%. Similar sensitivities were calculated for sera sampled on the day of and 4–6 days before sampling of positive blood cultures. Serological markers are valuable tools for the early diagnosis of candidemia. Ab, Ag, and BDG testing are all characterized by high specificity. The Wako BDG test is significantly more sensitive compared to combined Candida-Ag/Ab testing, particularly in the setting of non-albicans species and specific host factors. This study was supported by FUJIFILM Wako Chemicals Europe. We thank Hellen Müller for technical support. The authors report financial support for consumables and staff to conduct the study and temporary supply of technical equipment from FUJIFILM Wako Chemicals Europe. The funding source was not involved in the study design, in the collection, analysis and interpretation of data or in writing of the report.